The online gambling landscape continuously expands to cater for more markets, introducing innovative features to improve the level of play and entertainment. Bitcoin gambling is an integral factor in this process, and within this market, a new brand has taken the challenge to bring a new flavor to the table. FortuneJack may sound foreign to the ears, but this live cryptocurrency casino has been making a buzz in the Bitcoin gambling scene since its debut last month. Defying the age-old tradition of offering the typical services found in other brands, this platform shook it up by rolling out a range of Bitcoin casino games that complete the online betting experience. Unlike the majority of Bitcoin casinos, FortuneJack included a Bitcoin binary options trading service aptly called Binary Trader. It functions as a normal trading platform that allows registered bitcoiners to invest in various assets like EUR/USD, Gold, GBP/USD, and in trivial ones like Jack’s Wealth and Planes. Alongside its binary trading feature is its take on the Bitcoin prediction market. Anybet is an online service that enables bettors to win bitcoins by correctly predicting the outcome of a verifiable event, be it about politics, sports, or even the Bitcoin price. This Bitcoin casino further proved that it should not be labeled as merely another brand in the Bitcoin gambling market because it incorporated its fresh offerings like Bitcoin dice and video poker. 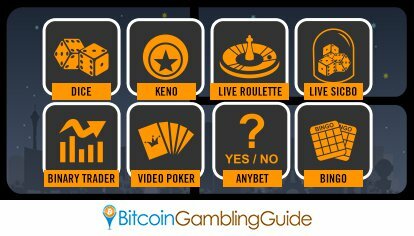 It also features its own set of lottery games, such as Bitcoin bingo and keno, together with its live game versions of Bitcoin roulette and sic bo. Moreover, aside from its online gambling services, FortuneJack further ascent the ranks with its revolutionary move to support a total of eight cryptocurrencies. Besides Bitcoin, Litecoin, and Dogecoin—three cryptos that have become commonly used in online betting—altcoins such as Darkcoin, Peercoin, Namecoin, Reddcoin, and Novacoin can also be used by players worldwide. Together with a set of Bitcoin casino bonus giveaways, instant no-fee withdrawals, and low house edge and rake, FortuneJack embodied what a new generation Bitcoin casino should be like.